I am still suspicious of the circumstances under which this book is being published. I have always admired Harper Lee for her willingness to walk away after writing just one great book, and I find it hard to believe that she is suddenly interested in having the public read what is essentially a rough draft of her beloved classic. It strikes me as suspicious that this decision came about only after Lee's sister died, and during a time when she is living in an assisted living facility. It doesn't sit right with me, and deep down, I don't think this is what Harper Lee truly wants. It was never intended to be a sequel. I've already read several articles talking about how the representation of Atticus in Go Set a Watchman has "ruined" readers' visions of him and caused them to question their devotion to his character. My response is that of course it has! Go Set a Watchman is not a continuation of To Kill A Mockingbird; it's essentially the writing exercise that led to To Kill a Mockingbird. I might be interested in a true sequel, but this is not that. I don't want to know what might have been. I appreciate To Kill a Mockingbird as it was originally published. It is a guaranteed disappointment. There is absolutely no way a second Harper Lee book published 55 years after the first can live up to the anticipation and hype surrounding it. Even if I found that I kind of liked Go Set a Watchman, it would still be a let-down compared with To Kill a Mockingbird. Why set myself up? There are plenty of other books for me to enjoy. Ignorance is bliss. 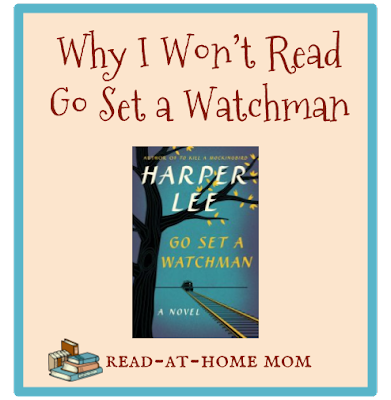 If Go Set a Watchman is going to ruin To Kill a Mockingbird for me, or if there is some revelation about a character that would forever change my reading of the original novel, I am better off not knowing anything about it at all. There is nothing about To Kill a Mockingbird that leaves me feeling unsatisfied or that I have been deprived of a proper resolution. I think, for true fans of the classic novel, Go Set a Watchman is a can of worms best left unopened. I'm with you on this one totally. Why set yourself up not only for disappointment, as you point out, but also for the possibly unbearable feeling of betrayal if what they say is true about Go Set a Watchman. I don't think this was ever mean to be published and should have stayed in the safety deposit box where they say it was found.